We’ve all been there. Whether it was leaving your homework assignment until the night before it’s due or preparing that presentation the day, or even morning before you have to give it. We’ve all procrastinated on important things. Sometimes out of laziness, sometimes out of the desire to do something more fun for the time being, and sometimes out of fear. In many cases we leave it even longer, and that important thing we let slide just doesn’t get done. Even when it does get done, I’m sure we can agree it wasn’t done as well as it could have been had we put some real effort into it. We all have our reasons, which always seems good at the time (and even in hindsight for those of us really experienced in the art of self deception). I think if we went back and compared what we gained from procrastinating to the consequences of it, we will find that it wasn’t the best course of action after all. I’ve now procrastinated so much on writing this piece, that I’m halfway through my next book already! I consider this to be good procrastination however, since I’ve been doing other things that were more important to my long term success. 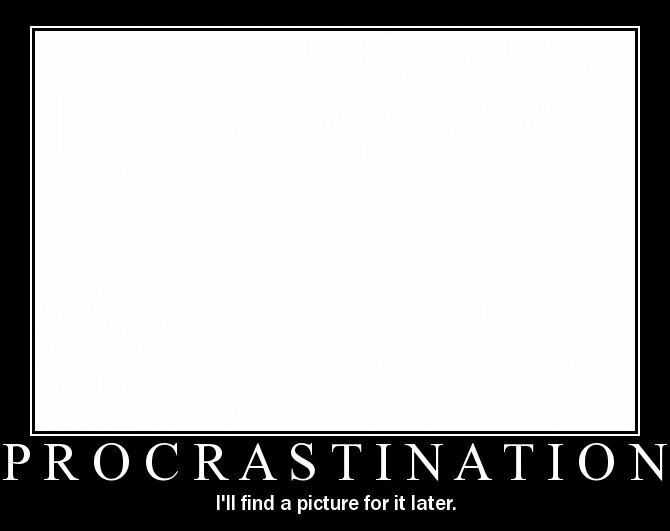 Brian Tracy, in his book ‘Eat That Frog’, calls this creative procrastination. It may be true that it’s sometimes good to procrastinate on something, but make sure you think thoroughly about the consequences first. After all, we all have so many things to do that it’s impossible not to procrastinate on something – the key lies in choosing the things of least importance to procrastinate on. I’ve been procrastinating in many areas lately and started reading Brian Tracy’s book. There was so much good stuff in it when I started writing this post, being only halfway through, but one point stood out to me, that I think can help a lot of people. I wanted to cover a portion on fear which I found very significant, believing this to be one of the major reasons for procrastinating. One of the major reasons for procrastination in the workplace is that people avoid jobs and activities in those areas where they have performed poorly in the past. I can definitely vouch for this from my own experience, but not just in areas of poor performance; this also happened a lot in areas where I had little knowledge. We are all uncomfortable doing something different, especially when it means doing something we know nothing about. A major reason for procrastination is a feeling of inadequacy, a lack of confidence, or an inability in a key area of a task… The better you are at a key task, the more motivated you are to launch into it. The better you are, the more energy and enthusiasm you have. When you know you can do job well, you find it easier to overcome procrastination and get the job done faster and better than under any other circumstances. One of best examples I have of this was when I was asked to start learning about how to be a planner for the sheet metal shop where I work, when I had no sheet metal experience. I had other things I was busy working on, but it wasn’t really taking all my time – or at least it didn’t have to be. Since there was someone already in that position, I didn’t feel there was any rush to get my feet wet and do the actual work – I kept letting him do it all, and procrastinated on learning the new job. Not knowing much about the process, the task ahead seemed daunting; I was waiting for that magical moment when things would all of a sudden become clear so that I would know what I was doing. Have you heard the term ‘someday never comes’? Well he soon got transferred to a different position leaving me to take over since I was trained as his back up. It was very uncomfortable at first since I didn’t really know what I was doing, but after doing it for 2-3 months, it turned out to be one of the easiest things I’ve done. I was happy to dive into it and take over the job. Are you waiting for that perfect moment to come before getting started on something, to make sure you don’t screw it up? Just do it – that perfect moment probably won’t happen until you’ve already done it. Do you need to talk to people in order to make sales, but don’t yet have enough confidence in yourself? Start talking to people and that confidence will come. Being the shyest guy I knew for such a long period of time, I’ve found this to be so true. Even with all the books I’ve read from the LIFE system, I still didn’t have enough confidence to talk to strangers; even though I now had the knowledge of how to be a good conversationalist. The only way I gained the confidence was by going out and talking to strangers. Having better information is also another way to overcome the fear that is causing you to procrastinate. Fear is often caused by a lack of confidence, and the more you know about something, the more confidence you will have. If you still have time before procrastinating becomes detrimental, then learn what you can in the mean time. Do you have to do a presentation in front of people, but keep putting it off due to fear of speaking? You may want to listen to the Public Speaking pack from LIFE. It may not take away the fear, but having better information will raise your confidence a little. Do the presentation as soon as possible though, or at least start speaking in front groups in any way you can. Sure, you will start off bad, but in anything you do in life you first need to be bad to be good.